The myBaby Sound Spa is a Best Seller and is Sooo Affordable! The myBaby SoundSpa is a lovely little sound machine for babies that is extremely affordable (currently less than $20) and is the ideal portable solution for settling your little one when you are on the go in the car, shopping center or just out walking. This baby soother is a Best Seller on Amazon, so you already know that customers love it and since it’s made by HoMedics – who are a highly regarded and trusted manufacturer of health and wellness products – you also know that you can rely on its quality. This sound machine plays 4 soothing sounds that are perfect for busy moms who need to calm their baby when they are unsettled and with a multi-level timer, you can set the music to play for a specific length of time (ideal for nap times) and it will automatically switch off at the end of the set time. Another great feature is that the myBaby SoundSpa is battery operated, so you can take it anywhere with you and with the integrated clip, you can quickly attach it to the stroller, diaper bag or cot. It also has a built in stand, so you can prop it up on the bedside table or dresser in your nursery. Play 4 soothing sounds (heartbeat, white noise, ocean and lullaby). Battery operated (3 AAA not included). Timer options (15, 30 or 45 minutes). Built in stand for stationary operation. Integrated clip for attaching to cot, stroller or diaper bag. HoMedics brand – well known and reliable. What do customers say about the myBaby SoundSpa? 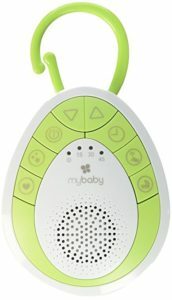 If we did a little deeper into the online comments about this sound machine, w e find that some parents have found that the myBaby Sound Spa isn’t very loud and that the batteries don’t last very long. On the other hand, most parents don’t have problem with the volume, but the battery life is still an issue for many. Since this sound machine requires 3 x AAA batteries to operate it’s understandable that they won’t last long – if you play the sounds for long periods of time. I guess that this particular baby soother is best used when you are on the go (when it can be a lifesaver!) and then at home you can use another device that can be plugged into the mains power. Works fine but is a battery eater. Great product, but it burns through batteries quickly. I love that it’s portable and hooks onto anything. I bring this everywhere we travel. I like that it’s portable and easy to attach to just about anything. Works great. Love the different sounds settings. Wears through batteries quickly, but that’s to be expected. I give this to all my friends at their baby showers and constantly get told how wonderful it is! If you want a sound machine to help settle your baby when you are outside of your home – in the car, shopping mall, visiting friends, etc., then you the myBaby Sound Spa might be right for your needs. It has all of the features you need – timer, continuous play, 4 soothing sounds and a clip to attach to the nappy bag, cot or pushchair – and it is a Best Seller on Amazon. However, the two consistent complaints are that the volume of the myBaby Sound Spa is too quiet and can easily be drowned out by other noises and that it practically eats batteries. In this case, you might want to compare the myBaby Sound Spa with the Marpac Hush which doesn’t have any complaints about the volume and also offers USB charging and rechargeable batteries (although it doesn’t have a timer). Check out my Top 10 Sound Machines for Babies here.